This is the second Keele Conference report. Aluminum is used as an adjuvant in many vaccines, but it’s a known neurotoxin. Dr. Christopher Shaw has been doing research on its effects, demonstrating that it crosses the blood-brain barrier, that it is strongly associated with autism, & that it has adverse effects on lab animals. Does it meet the cause-and-effect standard? Administration of aluminum in vaccine-relevant exposures in neonatal mice is associated with long-term adverse neurological outcomes. It has long been known that aluminum is toxic when eaten. By extension, it isn’t a stretch to imagine that it must also be toxic when injected, and very possibly even more so. Impairment of memory, cognition, and psychomotor control. Impairment of neurotransmission and synaptic activity. Interference with the blood-brain barrier. Activating microglia and brain inflammation. People are exposed to aluminum in a wide range of ways, including medications, vaccines, food, water, cosmetics, health products, and industrial activities. Exposure is ubiquitous in today’s world. Shaw reviewed several studies on different aspects of aluminum as a vaccine adjuvant. These are listed in Sources below. He and his team have clearly demonstrated that young mature male mice, aged 1-3 months, injected with aluminum adjuvant in doses comparable to those given human children is associated with neurological damage. In the first graph, you can see the results of a wire mesh hang. In this experiment, mice are hung upside-down as they hold onto a wire mesh. The time until they are no longer able to hold and drop off is measured. Notice that all three adjuvants had a definitive effect on their ability to hold onto the mesh, and that the mice injected with the aluminum adjuvant alone were most limited in the length of time they could hold on. In the second graph, you see the results of an open field test. In that trial, the young mature male mice are rated on how much time they’re willing to spend in an open area, rather than an apparently safe enclosed one. As in the wire mesh hang, you can see that there’s a significant difference in the mice given an adjuvant, and that the aluminum-adjuvanted mice are the least adventurous. Last are the results of the water maze test. This trial tests for how many errors a mouse makes in learning to solve a maze. It’s a test of memory. They were put through the maze several times, and as you can see, they make significantly more errors as a result of injection with an aluminum adjuvant. A simpler graph showing the distinction in amount of time can be seen to the right. Before injection on day 1, you can see that the average time to solve the maze is the same. However, after injection with aluminum, you can see how significantly the mice’s memory was damaged. In spite of having gone through the maze once already, it took them longer the second time, after injection. Morin labeling is a test that was used to identify the presence of aluminum in the spinal cord of these mice. The result of this test, shown above, clearly demonstrates that aluminum enters the lumbar spinal cord. Image A shows no sign of aluminum in the controls. The bright green spots in image B show the presence of aluminum in the aluminum-treated mice. To the right are the same results displayed in a graph. It also includes the squalene and aluminum+squalene injected mice. The existence of aluminum sequestered in the body as a result of aluminum adjuvants is, by itself, not an indication that there’s a problem. However, if inflammation is demonstrated to exist, then there’s reason for concern. The mice in this experiment showed distinct signs of inflammation in various places in the spinal cord as a result of being injected with an aluminum adjuvant. Continued on Page 2 with a focus on Autism. 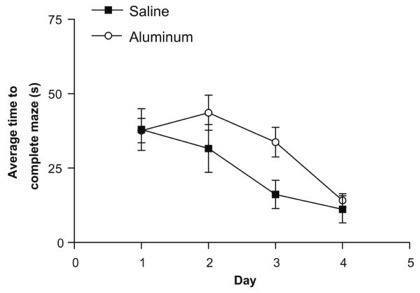 Administration of aluminium in vaccine-relevant exposures in neonatal mice is associated with long-term adverse neurological outcomes, page 61. 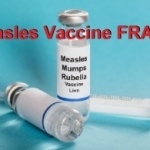 Aluminum Vaccine Adjuvants: Are They Safe?, Journal of Inorganic Biochemisty; L. Tomljenovic and C.A. Shaw; doi:10.1016/j.jinorgbio.2009.05.019.